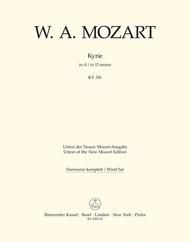 Kyrie d minor, KV 341 (368a) composed by Wolfgang Amadeus Mozart (1756-1791). Edited by Walter Senn. For 2 flutes/2 oboes/2 clarinets/2 bassoons/4 horns/2 trumpets/timpani. This edition: Stapled, Urtext edition. Stapled. Set of wind parts. KV 341 (368a). Published by Baerenreiter Verlag (BA.BA4702-65).ISBN 9790006453207. 32.5 x 25.5 cm inches.